In some instances bat colonies in a building may not cause any real problems and can be left undisturbed. In fact, a small colony of bats may go unnoticed for years. If bats become a nuisance for a home or building owner a bat exclusion has proven to be the only successful method of permanently removing them. An exclusion is conducted by positioning one-way devices at the locations where the bats are emerging from the roost. The one-way devices allow the bats to exit, but prevents them from re-entering. Physically capturing bats and relocating them is almost never successful because bats are often hiding in areas of the building that are not accessible. Even if bats are in an open area, attempts to capture them will likely cause them to flee into inaccessible places. Trapping bats as they exit a building does not work either because bats are frequently injured or die in the process of being captured and transported to a new location. Furthermore, bats moved to another location will almost always return to their old roost, even if it requires flying many miles. Trapping bats is illegal in Florida. Do not attempt to poison or exterminate bats. Bats are protected under Florida wildlife laws and it is illegal to willfully kill bats in Florida. Don’t just plug the holes. A lot of people think they can cover the holes the bats are using at midnight to keep the bats from getting back in. All of the bats in a roost do not necessarily exit each night, and in Florida, bats have often been observed returning to their roost early in the evening, long before midnight. Do not conduct a bat exclusion during the maternity season. It is also illegal to conduct a bat exclusion during the maternity season, which in Florida is defined as April 16 through August 14. The maternity season is the period of time that mothers give birth to their young and nurture them to adulthood. Step 1. Find the entry points. This can be done by observing the building during emergence time. Bats emerge from their roost shortly after sunset, so it is best to observe the building from sunset until dark. If there may be multiple emergence points you can watch different areas on different nights, or have other people assist you. A closer look at a hole or crevice that the bats are using will likely reveal staining around the edges from their body oils and a scattering of bat droppings on the wall. Step 2. Bat-proof all other openings. Carefully survey the exterior of the building during the daytime. Now that you know which holes or crevices the bats are using, you can seal up any other areas where they might get back in. Once the exclusion is conducted, the bats will frantically look for other entrances back into the building. Bats can enter any hole Â¾ inch in diameter, or any crevice of Â½ inch or more. Step 3. Install exclusion devices. Several exclusion methods have been developed over the years. Since every situation is a little different, we have found the most flexible approach is to use an industrial quality bird netting. A known supplier is Industrial Netting of Minneapolis, Minnesota. Netting with a 1/4 inch mesh seems to work the best. Although many hardware and gardening stores sell bird netting, the larger weave and lighter weight of these products will often entangle the bats, and a smaller weave may enable them to crawl on it and possibly re-enter the roost. Attach the netting above the opening using staples or duct tape. The netting should extend about a foot below the bottom of the hole or crevice. The sides of the netting are attached in a way that puffs the netting out and creates an open space over the hole or crevice, allowing the bats to drop out and fly underneath the netting. If you can easily slide your hand up under the netting, it should provide sufficient space for the bats to exit freely. When the bats return, they will attempt to fly directly to the hole or crevice, but it will be blocked by the netting. They will not land below the netting and climb up behind it to reach the hole, nor will they fly vertically up the narrow space between the wall and netting. Although the bottom remains open, the netting must be securely fastened at the top and on both sides. The exclusion netting can then be attached during the day when there is plenty of light. It is a good idea to watch the emergence the first night after the exclusion system is in place to make sure it is working properly, and that bats are not failing to emerge or getting trapped behind the netting. If a bat becomes tangled in the netting, it can be carefully removed while wearing heavy leather work gloves. If you are ever bitten by a bat you need to keep the bat for testing and seek medical attention immediately. Step 4. Allow time for the bats to leave. Before removing the netting, the area should be observed carefully at emergence time to make sure no bats are exiting. Florida regulations require that the netting be left up for at least four clear, warm nights to assure all of the bats have left. Bats tend not to forage on cold or rainy nights, so if the weather turns bad, it will be necessary to extend the exclusion an additional four consecutive nights. Consult exclusion regulations for details. If bats are still coming out after four nights, then they have either found another way back in or the exclusion system is not working and needs to be revised. If the exclusion materials become loose or detached, the bats will be able to re-enter, so make sure it remains secure throughout the process. Bats will be checking continually to see if they can re-enter their roost. Step 5. Permanently seal the openings. After the bats have been successfully excluded, the netting or exclusion devices can be removed during the day and the openings permanently sealed. Do not leave the netting down without sealing the openings, or the bats will move back in the following night. If the opening cannot be sealed immediately, the exclusion devices may be left up longer, but there is a risk that wind, storms, or failure of fasteners could allow the bats to re-enter. 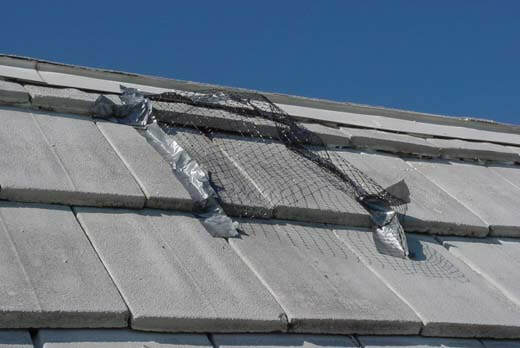 Another approach is to take the netting down and temporarily cover the openings with plywood or hardware cloth until permanent repairs can be made. Step 6. Cleanup. If a colony of bats has been in a roost for a long time there will likely be an odor and an accumulation of bat guano. In most cases, the odor is actually from the scent gland, not the guano, of Brazilian free-tailed bats, a bat commonly found in Florida buildings. This odor should disperse shortly after the bats are gone. Bat guano is basically made up of undigested insect particles and can usually be left undisturbed, if it is in a dry area of the building that is not used, or is inaccessible. There is, however, a fungus that can grow in soil enriched by bat or bird droppings that may cause a respiratory illness referred to as histoplasmosis. Cases of histoplasmosis due to bat guano have only been reported in Florida due to bats in a cave environment. If you wish to learn more about histoplasmosis we recommend you visit the Centers for Disease Control (CDC) website.